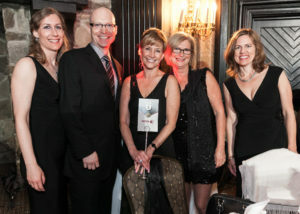 It is through the ongoing support of our highly-valued sponsors that allows Fight To End Cancer (FTEC) to continue being one of Toronto’s most prestigious fundraisers. One of these sponsors, in particular, is Xerox. Our friends over at Xerox have proudly supported the Fight To End Cancer, since its inaugural year back in 2012, as our Official Print Partner. At the FTEC2015 gala – Erin Schnepper in the centre with some of the Xerox team. As our Official Print Partner, Xerox has generously provided us printing services on all of our marketing materials; posters, banners, tickets, magazines etc., for a fraction of the cost. With each year, Xerox has consistently increased their level of support to us and the service they provide helps in making the experience for our guests, truly special. The relationship between Xerox and Fight To End Cancer was first formed through a personal friendship between Xerox’s Business Development Executive for Xerox Services, Erin Schnepper, and FTEC’s Founder, Jennifer Huggins. Erin was instrumental in helping to develop the relationship with Xerox by introducing the concept of Fight To End Cancer to her colleagues. Thank you for your ongoing support Xerox! With more than 130,000 Xerox people serving customers in 180 countries, we recognize the tremendous opportunity — and responsibility — we have to make work better and to positively impact our world. We may be a large global corporation, but we are made up of hundreds of local offices with valued team members in thousands of local communities. We make a difference in the communities where we live and work by investing time, talent and funding.